Standing in the airport with our Nicaragua Mission Team was a familiar scene. We had arrived in Tallahassee and were waiting on our luggage, sharing stories, hugging family members and adjusting to life back in the States. Then my family arrived. I had my big boy with me on the mission but then, in walked Brooke, Jake and Trent and leading the pack was Cole with his leg swinging (still immobilized) and his walker trying to keep up with him. Time stood still for a few brief moments. I don’t know if anyone captured that moment on film, but it will be forever etched in my mind. God’s timing was perfect in allowing me to be able to travel to Birmingham to see Cole’s cast removed and immobilizer fitted and start walking for the first time. But then I stepped onto a plane and into a third world country for the next week and a half. Daily updates and pictures were great, but not the same as being together as a family. Cole’s recovery post-surgery and cast has been going remarkably well – even while I was out of the country. He adjusted quickly to his immobilizer – which was required to for walking and even sleeping at night. It came off for some of the stretching exercises and swimming. We started physical therapy in Birmingham, but picked it up here in Tallahassee. He loves doing the pool therapy, but isn’t a fan of the stretches and flexibility exercises. As for moving around, he is out of the wheelchair (unless his legs get tired) and is using his walker. It seems we adjust and then readjust. But’s that’s life. God’s healing hand has been on Cole’s recovery. At his last physical therapy he was given the green light for the immobilizer to come off for good! 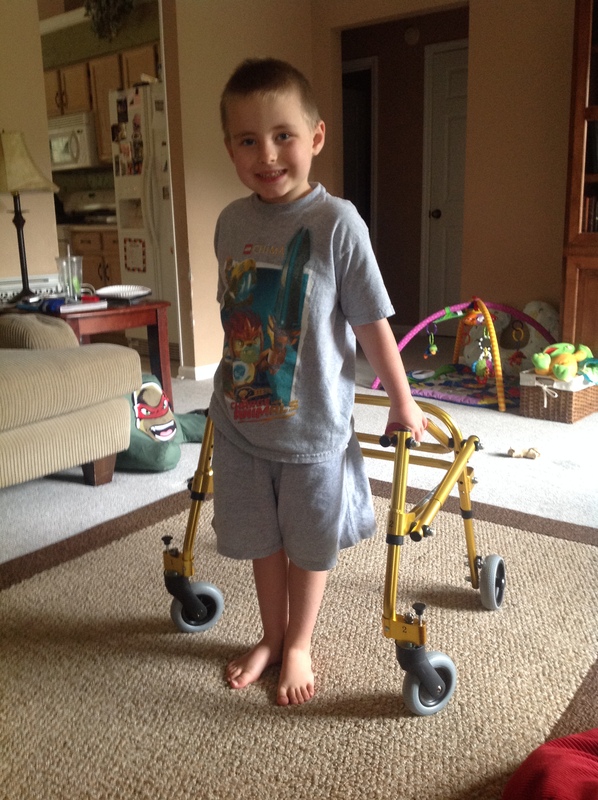 He still has to use his walker to walk, but he is moving around really well. He does still take it easy on his right leg and still walks with a limp. But his strength and mobility are returning at a much faster pace than expected. His physical therapy appointments are been spaced out more and more due to the great progress he is making. Between the pace of student ministry in the summer and the added journey we’ve been on with Cole… there have been some overwhelming moments for sure. But we have continually found God’s grace sufficient in this journey – sustaining us and giving us hope. And being back together… reunited… is such a great feeling. And as for the readjusting… well, I’m sure we’ll keep doing more of that each step of the way.